Last Wednesday I grabbed a coupon for a free McDonald's extra value meal and headed out to Innes Road in Gloucester to have lunch and buy a box of computer paper from Costco. 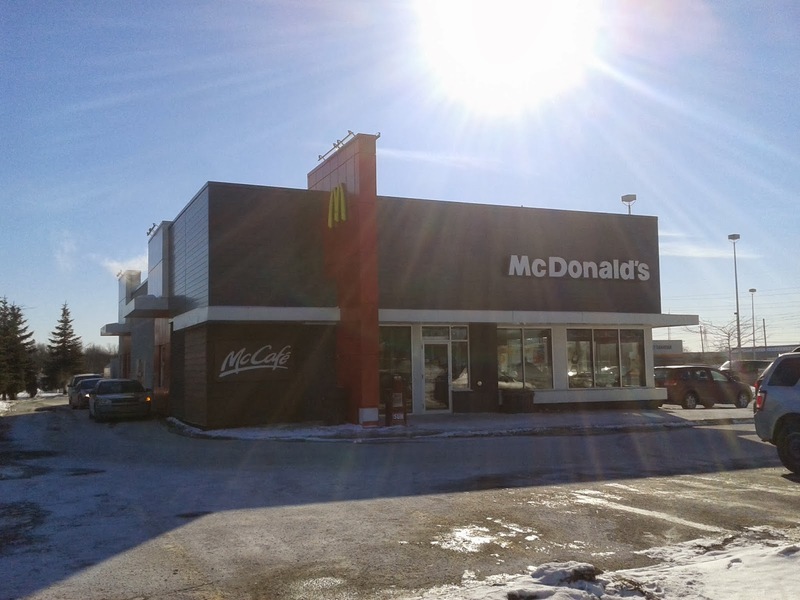 First stop though, McDonald's (1890 Innes Road, Ottawa) for a free meal due to one of my previous visits to the McDonald's location at Ottawa Train Yards. I visited the Innes Road McDonald's shortly after noon to find a calm suburban modernly renovated corporate standard interior. I visited the counter and waited for a customer in front of me to be finished ordering. I ventured forth after the previous customer ordered and was met by a smiling female employee. What a difference, she asked how she could help and I handed her the coupon and ordered. I paid and stepped to the left to wonder what was next. Would I stand there waiting for my order to hit my tray in aggravation? Aggravation that I would be able to see the packaged Big Mac slide down from the kitchen ready but nobody would be there to retrieve it? The smell of fries emanated from behind the counter, they were ready, but would someone be there to grab it? Would I have to vault the counter John Pinette, work the fries, get things moving and be employee of the month for January even though I didn't work there? Before I could I finish thinking of the above, the manager came over wearing the drive thru headset on, grabbeed the Big Mac, Fries and put them on my tray. He quickly followed up with a medium drink glass and I was off to the soft drink fountain to pour my Coke, grab some napkins and a straw. Over at the fountain pop station along with the condiment station, the place was clean. Not a strewn napkin to be seen or splash of Coke or ketchup to be found. Next, the table. I found a large booth table and sat down. It too was clean and so was the one behind me that the previous customer sat down with his wife at. How was this McDonald's able to do so well cleanliness wise? Before I could open the Big Mac container or taste a french fry, the answer was right in front of me. A manager who had broken his arm, picked up a small stack of trays and was returning it to the front counter. He was doing what he could with a broken arm to keep the place going. Cleaning up the seating area and running orders outside to those who had the unfortunate luck of ordering something that wasn't quite ready. The manager had a smile on his face moving as fast as he could with one arm doing the moving and the other in a sling. The Big Mac and Fries were perfect. Made to corporate standards without anything missing on the burger and both were the perfect temperature.